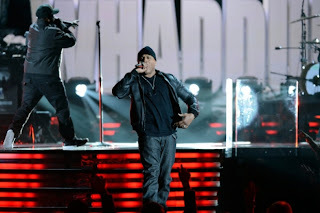 LL Cool J may have made a fool of himself shoehorning the word "hashtag" into every other word during his second Grammys hosting stint but he more than made up for that #internet geekery with a fierce performance of his new song "Whaddup" accompanied by a Sheeran-free A-team of rap-meets-rock baddasses: Chuck D, Tom Morello, Travis Barker, and Z-Trip. While the track had hints of Public Enemy's "Welcome to the Terrordome" and the Beastie Boys' "No Sleep Till Brooklyn" in the mix, it hails from Cool James' May 7-due album Authentic, and is now available for purchase in iTunes. You can also experience this beast of a song via the YouTube stream below.